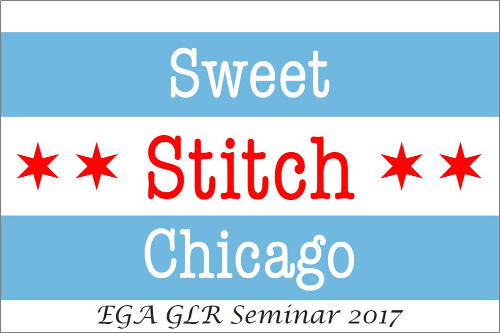 Seminar 2017, Sweet Stitch Chicago, will be held May 6-10, 2017 at the Chicago Marriott O'Hare. The hotel offers convenient access to both O'Hare Airport and downtown Chicago via the CTA Blue Line. The seminar is hosted by the Windy City Chapter (Chicago). Registration is now open! The first day of Registration is October 15, 2016. If you submitted your Early Registration, you must postmark your final registration form by October 15, 2016, or you will forfeit your Early Registration deposit! The Registration Book (2.1Mb) is available for you to download. You may also download a blank Registration Form (136 Kb) separately. Online registration will also be available soon. All seminar participants must be registered guests with the hotel, for insurance purposes. Reservations can be made now for our room block at the Chicago Marriott O'Hare. The seminar rate is $135 per night (plus tax) for either one King or two Doubles (up to four adults per room). You may register online or call 773-693-4444 to reserve your room. If you call, be sure to request the EGA-Great Lakes Region Seminar room rate. If you are sharing a room, be sure to let the hotel know the names of all participants in the room. Please note: Our room rate includes free parking. Please disregard the standard parking rate shown on the reservation link.